Trying out the Flickr "blog this" thing. This quilt still needs outer borders; they will be from the same stripes as the sashing. 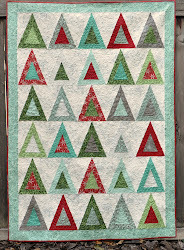 I'm actually thinking of quilting this with straight lines; with squares maybe 1/4" from each square's seams. I've gotta finish this in the next day or two so it can be put in the mail.